Buxom British babe Adele's 2011 song Set Fire To The Rain is something of an enigma. 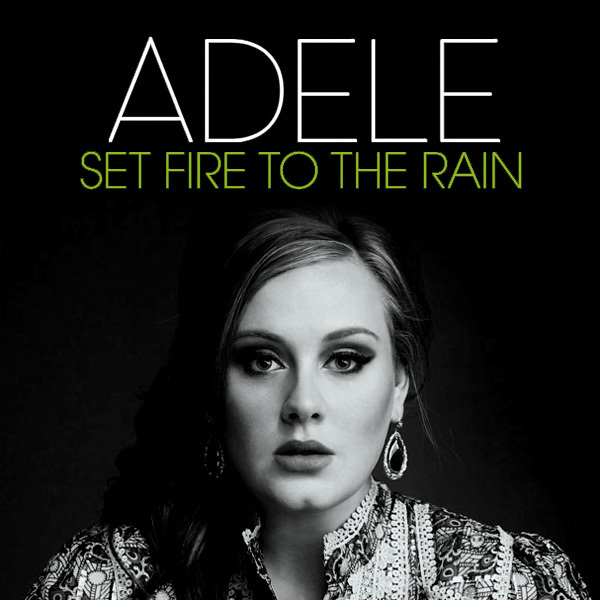 The cover for the single shows Adele but gives no indicate of how the act of setting fire to rain is to be carried out. When it comes to setting fire to rain, then this is a bit of a thorny problem. On Earth at least, the fact that rain is made of water tends to rule out any flammability. So it must be that the rain in question would be on another planet where the atmosphere is made of volatile hydrocarbons such that the rain can be ignited. This would also require the air to have some oxygen content and, if not handled carefully, could result in the complete planet being burned to a crisp. It seems unlikely then, that Ms Adkins is singing about setting fire to rain in a literal sense, but more in a metaphoric one. How, then, does one set fire to rain metaphorically. One option might be to shine orange light into the rain and make each droplet appear to be on fire, though the fact that when it hit the floor, it would extinguish any existing fires would make this rather pointless in many ways. The option that makes most sense from a 'cover of a single' perspective, is that setting fire relates more to making the rain appear hot, and by appear, this is not raising its temperature, but adding something that is aesthetically 'hot', and by aesthetically hot, this does not mean just the color orange. What could possibly be hotter than a naked girl, except perhaps two naked girls. The revised cover features just this juxtaposition - a naked girl in some rain - who is metaphorically setting fire to the rain by being a hottie. Whether this is what is meant by Ms Adkins is not certain but it is sufficient, aesthetically speaking, to decode the enigma hidden in the song's lyrics.